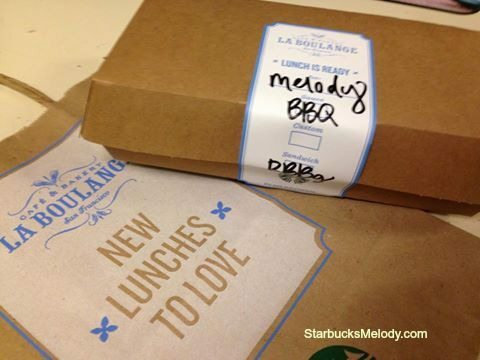 Starbucks Testing New Lunch Sandwiches. (Grilled cheese coming soon everywhere). Starbucks wants you to swing by for lunch. 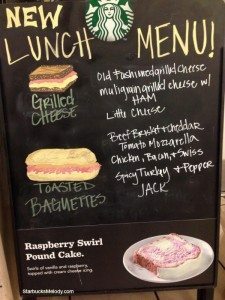 In order to entice lunch-goers, Starbucks is testing out several new sandwiches in roughly 178 stores, between two cities. If you’re in Phoenix, Arizona, or Richmond, Virginia, you might find these new lunch options. This Bloomberg news article does a thorough job of covering this lunch test, and lists new items and prices. 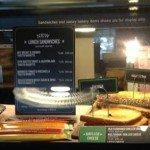 It mentions that Starbucks hopes to launch new lunch sandwiches nationwide by 2015. Notice that the lunch test includes a variety of sauces as options too – pesto and ketchup! The menu says they’re complimentary with “any warmed sandwich.” Now and then, I’ll see idea threads on MyStarbucksIdea.com request ketchup for breakfast sandwiches. This test gives Starbucks the chance to track ketchup use too (assuming that baristas are entering ketchup in the register every single time so that Starbucks can really track which sandwiches customers want to put ketchup on). This lunch test includes the “Old-Fashioned Grilled Cheese” sandwich which has been a popular item, so I hear. The Old-Fashioned Grilled Cheese Sandwich is scheduled for national launch on June 24, 2014. It’s white cheddar, yellow cheddar, and mozzarella on multi-grain toast. Here are just a few more photos: What sounds good to you? Friday the 13th, a full moon, and one full month of true Starbucks Tales. If I had a penny for every time I heard a customer ask for ketchup, I would be rich! I love a good grilled cheese sandwich, but I am a bit confused as to how they are going to make them? Heat them in the oven and not grill? I’m looking forward to grilled cheese too. It should be made the same way as the current egg and cheese – in the TurboChef, butter side down. I was glad to see peach and melon syrups back, altho not ‘officially’ out yet. Why we can’t get coconut (syrup) is beyond me, and seems much more appropriate for Sbux (once a Coffee Shop) than the frozen/heated ever-expanding food items. I really question how good the grilled cheese would be cooked in the TurboChef. What comments have customers made re the quality? 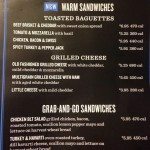 @Purple1 – This new sandwich is pretty much like the current egg and cheese, but without the egg. Given that the egg and cheese is pretty darn good, I think this should be fine in the turbochef. ‘Course, taste is subjective. @denise – Profitability is the key to success. If I want Starbucks to be able to continue funding health care for part-timers, origins trips, great customer service, generous rewards, then I have to expect that they MUST act to get customers in their stores during every day part. This is a natural extension of that – nothing here is more intrusive than what’s already been offered at Starbucks, at one point or another. I don’t see why a spicy – turkey sandwich would be anymore anathemas to the business than things like the current mac and cheese at the evenings stores – which I absolutely love! @Serina C – The chicken curry is NOT in Seattle. Yep, good catch! That’s part of the test. I would like to try that one too. Funny, I have never had someone ask for ketchup. Salt and pepper, yes. And hot sauce, actually. Interesting. I’m excited to see new options come up! Did you see the calorie content of the old-fashioned grilled cheese? No, thank you. But I’m interested in some of the baguettes. Have to say I LOVE that they are bringing back sandwiches with condiments on the side! As a “picky” person, this opens up a lot more lunch options for me, where right now it’s basically just the ham and swiss panini w/Dijon. Beef brisket with cheese? I’m going to get soooooooo fat if that one comes out nationally. I’m with Denise on this one. I’m not going to rant away about how Starbucks seems to be walking faster than it’s brain can think these days. I’m happy for those that are glad about this, but I for one am not one of those people. Starbucks is becoming something, and for me it’s hardly the “3rd Place” anymore. I could go on and on about the things they have done that need fixing now, and they don’t need to skip over those things and not address them before moving on to other things. Lines are out of control at Starbucks because of La Boulange. 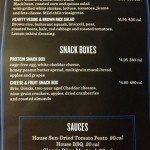 Let’s not add more things to the menu that don’t help the lines they have created first. Let’s not forget that Coffee is what I thought they were supposed to be about. That’s what has always attracted me, but I’m not feeling it anymore. There is no guaranty that throwing more at the menu board will be profitable or benefit the partners in any way. 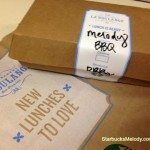 You know I have the utmost respect for you Melody, and what you do here with your blog. This is one of those things I can’t agree with. I have too much I could say about Starbucks these days, but I will not rant about it here. I will just continue to get my coffee everyday and keep my mouth shut. If and when I hit that crossroad when I have had enough, then I will have a decision to make. I’m not there yet, but I see the fork in the road up ahead. I think the mini cheese sandwiches for kids or little snacks will sell like crazy! Just like the banana bread. It’s funny, my store serves ketchup, but no one ever asks for it!! I’m really excited about the grilled cheese…I can’t wait till we get ours in to sample!! Price wise, those new items are pretty much where I’d expect them to be, but I still think they’re too expensive. Maybe if I wanted to treat myself, but since 1 drink and 1 sandwich would come close to $10 (depending more on which drink you get) that’s kind of pricey. But out of all the test foods, I’d still rather stick with the tomato and mozzarella panini or the chicken santa fe panini. Grilled cheese! Mmmm! Maybe even with pesto?! That sounds amazing! I live in Phoenix so Ive had a chanc to try the items in this test. 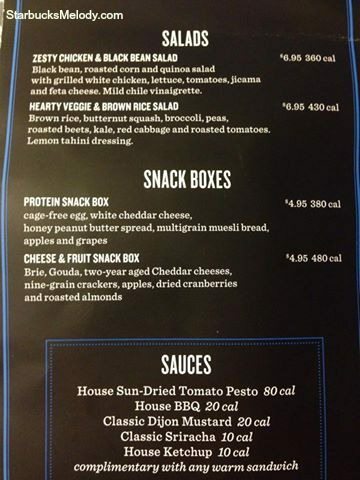 all three of the grilled cheese options are decent. The old fashioned grilled cheese it is huge. I’m a guy and I can’t finish it in a serving. My only complaint about the grilled cheeses is the consistency of the toasting. I’ve had a couple sandwiches that were burnt in one area and ice cold in another. overall though they are a good value for the money. 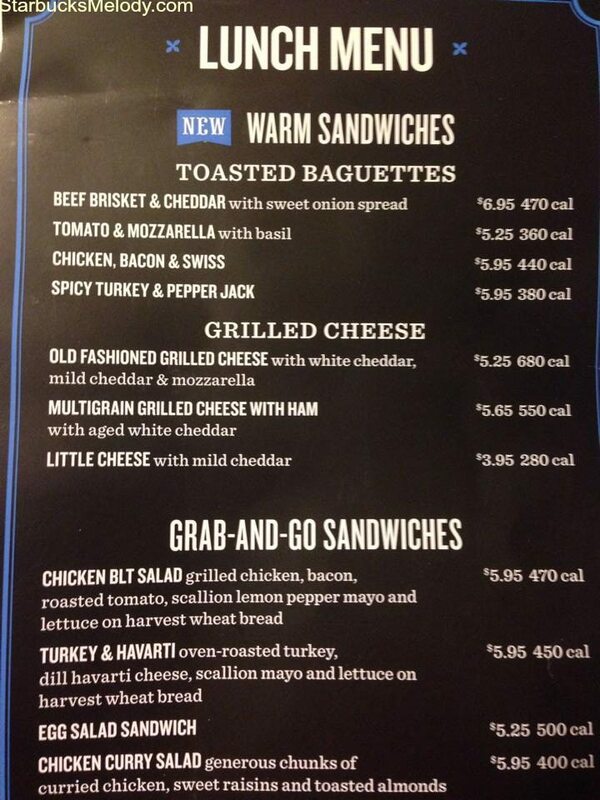 There are also two new cold sandwiches and a couple of salads too. Do we know where we can find the nutritional info on the beef brisket?? Its delicious by the way! !